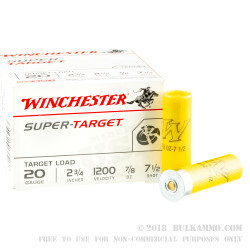 Busting clay targets has never been more pleasant and affordable than with these 20 gauge #7 1/2 shot shells from Winchester! Shooting clay targets is fun. It has always been fun and will always been fun, that’s a simple truth. But after a while, that recoil can wear a shooter down, which is where the 20 gauge comes in! With these 20 gauge shells from Winchester, you can shoot for longer, which means more practice, and more importantly, more fun. 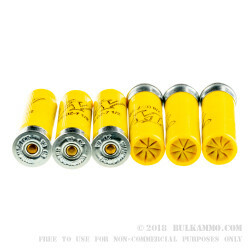 These 20 gauge shot shells are loaded with the extremely popular #7 1/2 shot, which is an ideal choice for target practice on a few clay birds. These shells are 2 3/4ths inches in length, so they’ll fit every common 20 gauge shotgun on the planet, and feature a muzzle velocity of 1200 FPS, so they won’t kick very hard. 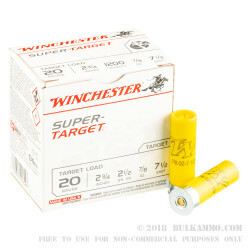 Sold in boxes of 25, for a pair of twenty-dollar bills you can drop 125 of these 20 gauge shotgun shells in your range bag and have a wonderful day at the range blasting clay targets in to dust!